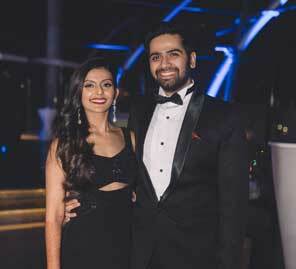 A self-planned wedding, a self-designed trousseau – self-confessed ‘control freaks’ Aanchal and Akshay make organizing and executing a glamorous, beautiful wedding at the Rixos The Palm, Dubai seem like child’s play. 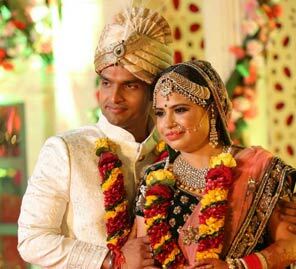 “Akshay and I met five years ago through a mutual friend at a club. We started talking eventually and I began to notice his subtle romantic gestures which were very cute. A year and a half later, we were dating. 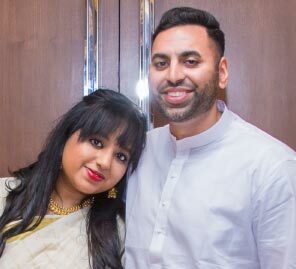 “We considered several Indian cities and even recced a few but finally decided it should be Dubai since our families and friends live there. It was easier to organize as well, a boon for us with our busy work schedules. “Akshay and I are minimalist and wanted subtle, sophisticated décor. We don’t really relate to the trend of having ‘themes’ which also come with dress codes, something we were keen to avoid. Our Mehndi decor was just entirely marigolds which I have to say, left me and our guests stunned. We had beaded colorful bangles for the ladies and made special parrot-shaped brooches for the men as party favors. There was a really cute photo booth corner for the guests. “Our sangeet decor was very minimal as the grand ballroom at the W Hotel, Dubai didn’t need much enhancing. The ballroom at the W Hotel is one of a kind with a really young and hip feel to it. We were in love with it the minute we stepped in. We did play around with mood lighting though, which definitely made the setting look very glamorous. “The wedding was a very traditional one and our décor was in sync with that aesthetic. We had a magenta beachside mandap decorated with fresh flowers and pink lighting to add to the romance. Akshay had always said he wanted me to dress in traditional red at our wedding and so I decided to make this lehenga very ‘me’. I had Hindu wedding rituals lke the var mala, bidaai, baraat embroidered into the border of my lehenga. It was a risk – I thought it would be a total disaster or extraordinary. After all the sleepless nights, it turned out just the way I had imagined it. “We hosted the reception after the pheras. From the early days of planning we’d known we wanted to engage and celebrate with our guests and dance the night away. We had an LED dance floor and after our first dance as a couple we went around to meet our guests rather than them coming to meet us which was much appreciated by all. Any advice for ‘to-be’ couples?